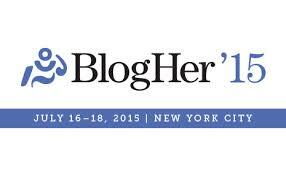 This past Thursday-Saturday was the BlogHer 2015 Conference. I really wasn’t sure what to expect at all- I had been too busy to read every “A Message from Our Sponsors” email (which was sent almost daily) or the updates about the keynote speakers. Seeing as it was in NYC, I figured I’d just hop onto the train, show up and figure out what was happening when I got there, which was pretty much how it happened. While I’m not a spontaneous kind of girl, I am very much a “last minute” kind of girl- aka, I have things planned and organized in my schedule, but I don’t actually do the prep work or research I need until the very last minute. This, of course, is exactly what I did at the BlogHer Conference. That being said, I learned a lot about what to do an expect at a conference, and what to do differently next time. Read over what I learned and don’t make the same mistakes I did! If you’re traveling for a conference, this shouldn’t be a problem at all, but if you’re like me and the conference is local, make sure your schedule is completely clear! I said “no” to a lot of things for the weekend but of course, in the end, it was the one weekend in the summer where everything popped up last minute. I ended up spending a lot less time at the conference than I had wanted and was really only able to fully attend one of the learning classes. Bring more than you think you’ll need- you can’t have too many! I made the completely rookie mistake of not getting around to printing my cards in time and yeah-it was a huge error on my part. I ended up hand-writing a lot of “business cards” which was tedious and unprofessional looking. Business cards aren’t just for exchanging information amongst other bloggers- it’s also for sponsor booths, giveaways and raffles. Don’t miss out and keep it classy- print tons of cards! Look at the conference schedule fully and organize where you want to be. There will a lot of talks and classes going on at the same time so figure out your first and second priorities within a certain time block. You may go to the first one and find it wasn’t exactly what you were looking for and if that’s the case, head off to the second one! With so many exciting things going on, it can sometimes be hard to keep your goals in focus. Remember what your blog and your brand is about. There will be tons of companies giving out samples and asking about sharing or discussing their products on your page- giveaways, free products, just a quick little “tweet”- you name it! I found myself inundated with things from giant companies like McDonald’s and Coca-Cola (some of the major sponsors, unfortunately) to smaller companies that sell things like natural cleaning products or make-up and skin care products. For the sake of your readers, it’s important that you maintain an understanding of your online brand and image. For me, McDonald’s and Coca Cola go against just about everything I stand for in my personal life, but also in my professional and online life and cleaning products and beauty supplies just aren’t what I write about (neither are baby/children’s products). Once I reminded myself that, it was easy to say “no” to every free product that was being handed to me and to focus on asking questions and forming potential relationships with brands and companies that reflect my page. You’re at a blogging conference- make sure you talk about it! Regardless of what you write about on your page, it can’t hurt to tweet or use Instagram or other platforms to share your experience. There’s something there for every blogger so make sure you share it with your readers. If nothing else, make sure to tweet about it to some of the other bloggers or companies that you met and enjoyed. Following up and keeping in contact is important for forming relationships and expanding! And as a final note, don’t drink too much. I heard other women discussing it on Friday about having too much fun at the evening party on Thursday and I definitely did that on Saturday. Have tons fun, let loose a little, enjoy yourself but still try to be somewhat professional- if nothing else, those extra drinks probably won’t feel so great the next day (even if they were free). i didn’t take business cards to my first conference–didn’t even think about it! i was so embarrassed when company representatives asked for one…talk about a failed connection! :/ good tips! At first I was honest about about telling people that I had forgotten to get my business cards and then later in the conference I told people I had run out (just to save some face). These are great tips! Thank you for sharing. I definitely want to try and make it out next year! Also, I love the redesign!! I hope to see you around next time- I’m wondering where it will be though! Great info and tips. I hope to attend next year and these will come in handy! Thanks!